New York is a state that’s at least attempting to make progress as it pertains to making poker games more accessible to its residents. New York is one of the states actively trying to make gambling work – both on and off the internet. In fact, they just approved their first three commercial casinos. 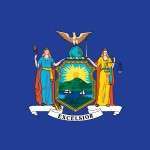 There are also reports stating New York will pass online poker legislation – sometime in 2016 or 2017. So, there’s a ton of good news and things to look forward to. But …what can you do today? What’s legal today? These are definitely allowed and are very much legal. The biggest rule to abide by is to not take a cut of the action. Don’t charge people to play. I recommend not charging people for food or merchandise, either – at least until you clear it with authorities or a lawyer. Right now – it’s illegal to play online poker. In fact, New York is one of the worst states for offshore poker sites / players. Many offshore sites don’t even accept players from here. So, you might have a hard time finding a legitimate site. Live poker is an option – but only in licensed tribal casinos. You cannot host a poker game otherwise. Some people have found this out the hard way. One story that made the rounds a couple years ago was about a guy that ran a poker game. He collected rake to pay him and his employees. But that got him in trouble. He faced 10 years in prison and felony charges. The first judge to see his case in 2012 acquitted him, saying that poker was a game of skill. But that ruling was overturned and reversed in 2013. The moral of that short story? You want to stick to home games or licensed tribal casinos until the state builds their own. All of these casinos are Class II and III – meaning they’re allowed to offer poker. But they also have table games, video poker and slots. You can even bet on horse races. So, there’s plenty to do while the state builds out their first 3 approved casinos. That might take awhile, though, since they were just approved in December 2014. Isn’t it obvious? In the future we’re going to see progress. How much and when, though – that’s the real question. I’ve seen reports that suggest New York will regulate online poker in 2016 or 2017. But I think it’ll take longer than that. I mean, according to Gary Pretlow (the guy that heads the Assembly Committee on Racing and Wagering), we’ll see online poker bills introduced in 2015, but no voting. Between that and the new commercial casinos, I think it’ll be a few years longer before we see online poker legalized. I expect that New York will want to build out their brick and mortar casinos first (like most states). Then they might turn their attention to online poker. I think some ‘experts’ overlook this, and forget how long these things take to materialize. It can take months, years even, to get through the paperwork, licensing and building the casinos. So, I expect online regulation to take a few years longer. But I’ve been wrong – it happens often, in fact. We’ll just have to wait and see. The good news is I don’t expect we’ll have to wait too long.